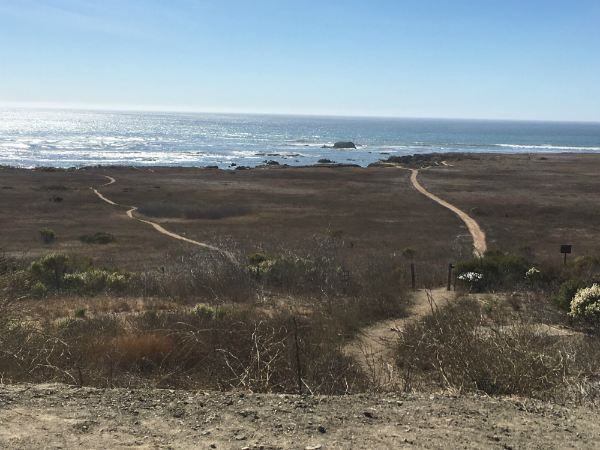 Here’s one of the stops I often make when driving home from the big city of San Luis Obispo to our sleepy little town of Cambria a couple of times each week. I don’t typically admit my whereabouts if a call comes in during the drive. I’ll usually say, “…let me pull over in a parking lot or pull out, just to be safe.” It’s hard not to have good thoughts or have an excellent conversation when this is the “parking lot”. Count “you” twice it’s only five words, but if it is someone’s full name it could be seven or even eight. What have you communicated to a customer – any customer – that says, “thank you” or tells them that you love their patronage and do you regularly use their name? I’ll accept that full personalization or customization might be difficult on every channel, but expressing appreciation and care ought to be the lowest common denominator of customer interaction. D-o y-o-u m-e-e-t t-h-a-t t-h-r-e-s-h-o-l-d? Next, a quick story – a few days ago while driving through Morro Bay I pulled in behind a gentleman in a station wagon who was single-handedly trying to put a small chest-of-drawers and several related wooden planks back into his vehicle. Apparently, when pulling away from a stoplight they slid out. There was no way he would get everything back in by himself. Here’s the kicker – I stopped; a couple walking across the street did, too; and, one other car pulled in behind me and two folks got out to help. What would have been impossible was accomplished in under three minutes with five strangers lending a hand. All this leads me to wonder, shouldn’t businesses create what might be called a “HELP Metric”? Wouldn’t it be great to measure how many customers you truly helped today? This week? This month? How much did you help customers achieve their goals? To what extent (if any) are those you help increasing their business with you? Are trends positive or negative? What can you learn by segmenting your Help Metric by salesperson or product or customer size? I can already hear you asking how to do that. Or worse, saying, “There’s no way!” However, before immediately leaping to any conclusion, take a few minutes and t-h-i-n-k about it. Or, better yet, ASSUME there’s a way, then take the steps required to figure it out! My sense is by creating such a Help Metric and tracking ever-improving (hopefully that’s the case) results you’d do a great service to readers and business customers. Plus, do wonders for morale and customer service. So, get after it, would you? Happy Thanksgiving to everyone! May your holiday be full of family, friends and fun! Thank you for reading ~ I love the fact you do!